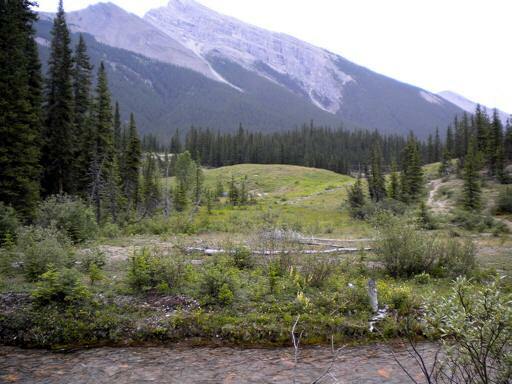 Campsite #2 is at the northern end of Spray Valley Provincial Park, off Hwy 742, 7.3 km south of the Three Sisters Drive intersection in Canmore, and 2.1 km north of the Riding Ridge. The easiest way to access the site is to follow Hwy 742 and park at the Goat Creek Picnic Area. Walk south along Hwy 742 for approximately 200 meters. At the point where the utility lines cross Hwy 742 you will see a gravel road to your right (west). Turn right and follow the gravel road approximately 0.7 km downhill until you reach a clearing. Turn right and continue across the clearing, passing the “Get Goin’, Cowboy” Hillside (Fight Hill), and the Dozy Embrace site. If you encounter temporary fencing in this area, go around it to the right. 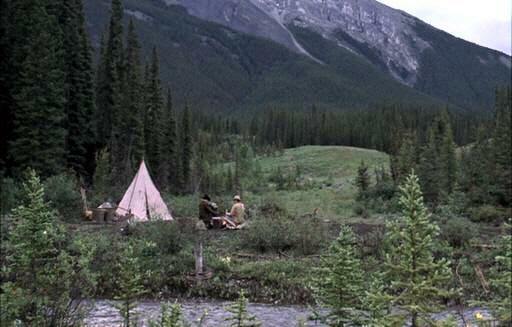 As you approach Goat Creek, you will see the familiar pole bridge and campsite. For pictures taken during a hike to this location, see “Hike to Campsite #2” in Albums. Note in the photos how prop trees were used to mask the rather conspicuous pathway on the right side of the “Get Goin’, Cowboy” Hillside (Fight Hill). If you look in the woods you’ll find these discarded trees which are easy to identify by the metal spikes mounted at their base. Campsite #2 has other artifacts, as well. Should you find something that others might enjoy, please let it be.